Dry ice blasting, otherwise known as dry ice cleaning, is a more aggressive form of precision cleaning using dry ice pellets instead of CO2 snow. 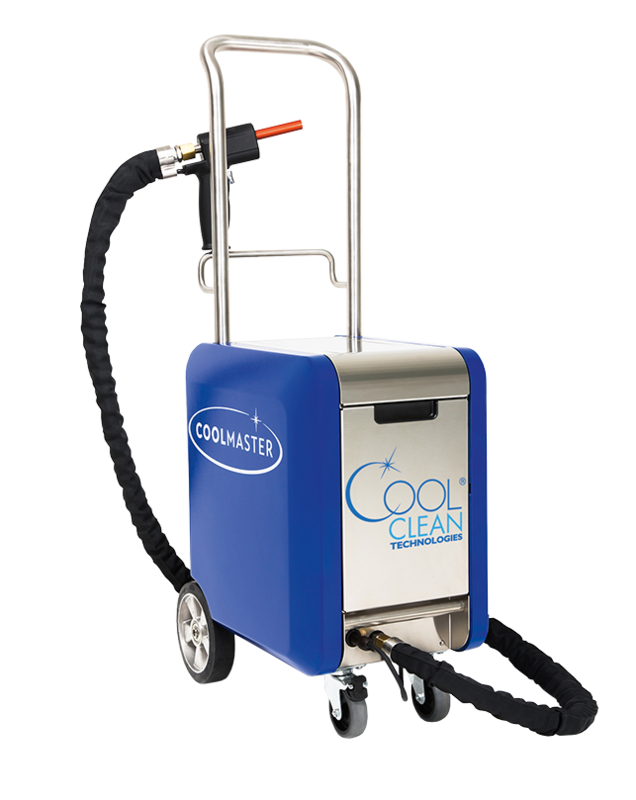 The latest in dry ice blasting technology, the COOLMASTER by Cool Clean Technologies was developed with the aim of permanently changing the cleaning industry. The COOLMASTER is a product which sets new cleaning standards in all industries. The COOLMASTER starts where other cleaning methods and devices reach their limits. Unbeatable for flexibility and range of application, the COOLMASTER is perfect for removing contaminants in all sectors. Particles of various sizes, surfaces and degrees of soiling are cleaned efficiently and powerfully, yet gentle to the material with the COOLMASTER. The COOLMASTER saves resources and is less time consuming than traditional cleaning methods. The COOLMASTER reduces the downtime of machines, as they often do not need to be dismantled, and can be cleaned right in place. The COOLMASTER sets itself apart with its ergonomic, modern design and provides the new standard in quality and performance, while improving economic efficiency! The COOLMASTER accelerates the particles of dry ice to an extremely high speed combined with a jet stream of compressed air, and subsequently blasts them on the object that needs to be cleaned. This creates 3 different effects which enable an optimal cleaning procedure. The first effect, also known as the kinetic effect, is where the COOLMASTER accelerates the dry ice particles to high speeds. The following impact that the particles create causes the second effect, as they hit the layer of dirt at -78,5°C the surface is dramatically cooled down, contracts and creates cracks. Through the different coefficients of thermal expansion, the compound of surface and dirt is loosened. The third, and most important effect, results in the change of the physical condition of the dry ice particles. Upon impact the carbon dioxide directly transforms, or sublimates, from a solid to a gaseous state and expands about 700 times the volume within a split second. This expansion literally “blasts off” the dirt from the surface. At the end of the cleaning procedure the loosened dirt particles can be easily disposed of with no remaining residue or CO2 crystals left behind. Where can Dry Ice Blasting be Used? The areas of application with the COOLMASTER are nearly endless. Even persistent substances such as greases, oils, glues, food residues or paint can be removed. The COOLMASTER can be used for far more applications as one might initially think of. The dry ice blasting system can be easily adjusted to clean some of the most difficult materials and surfaces without causing any damage.